Thanks to Andrew Abela of Extreme Presentations for inspiring Chart Chooser with his “Choosing a Good Chart” post and for working with us to put this tool together. We’ve tried to make the charts both Tufte-compliant (i.e. minimal chart-junk) and visually attractive (thanks to Google for the color scheme). Feel free to suggest other types of charts that you’d like to see in the Chart Chooser. Send an example to chartchooser@juiceanalytics.com. 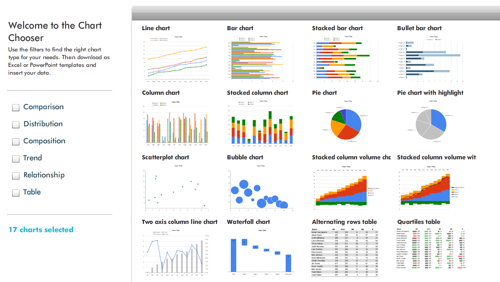 If you’d like a customized version of Chart Chooser for your organization, write us at chartchooser@juiceanalytics.com or call me at 202.251.7750.